Place the cranberries along with all the other ingredients in a food processor bowl. Pulse together briefly until desired texture is achieved (somewhat diced, somewhat chunky). Place in a 9 x9 or pie pan. 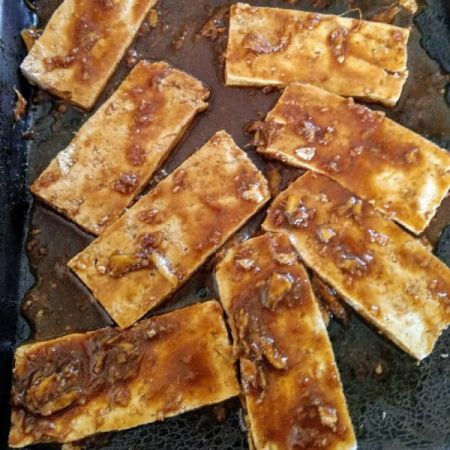 Place Tofu or Tempeh into marinade, let soak up marinade for 10 minutes, flip. Spoon the marinade over the other side of Tofu or Tempeh, let sit an additional 10 minutes. Flip and bake for an additional 15 minutes. Tofu will brown and puff up, Tempeh will brown. 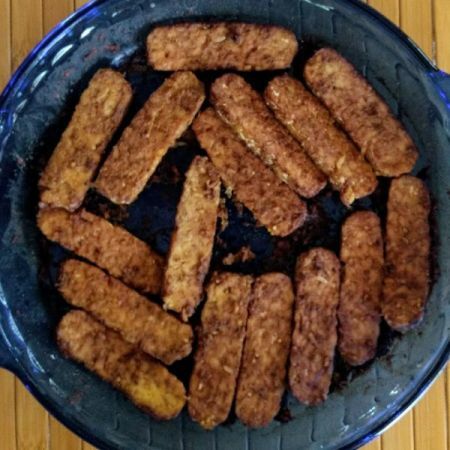 You can use hot-out-of-the-oven Tofu/Tempeh immediately for a sandwich. You can cool Tofu/Tempeh, and then use in a sandwich or stir fry, too. Soak buckwheat and millet overnight. Wash and drain. Groats will absorb about 3.2 oz of water. 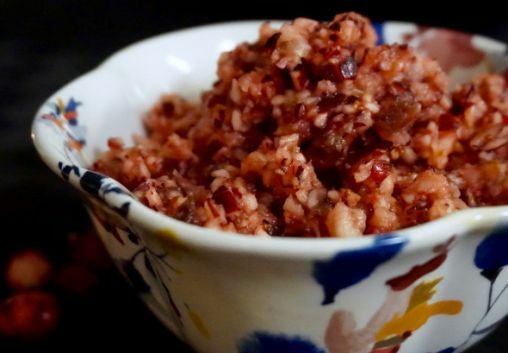 Pour hot water over sundried tomatoes. Let them soak for at least 15 minutes. Use a non-stick waffle form or spray lightly and pat out all excess. 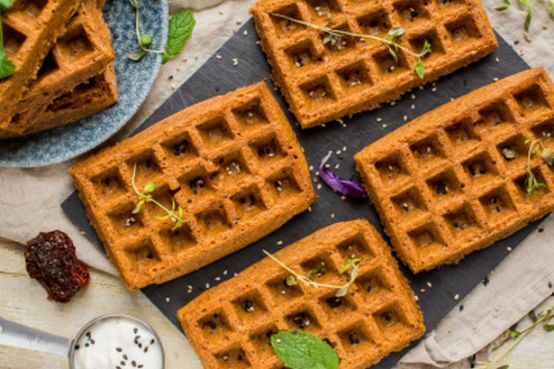 Place waffle forms on a baking sheet lined with parchment paper. Finely grate potatoes. You’ll have 1 c grated potatoes. Drain and rinse the tomatoes, cut them into smaller pieces and add with all the other ingredients (EXCEPT potatoes) in blender and blend until homogeneous batter forms. Add liquid gradually. Finally mix in (don’t blend) grated potatoes. Let sit for 10 minutes. Divide batter between waffle forms using ladle. Bake waffles for 25 minutes, until you see they are quite firm and golden. Then turn the waffles upside down on the baking sheet and let cool almost completely (about 20-30 minutes). When you touch the forms they should feel similar to your hand temperature. If they are too hot, it’ll be trickier to get them off nicely. Bake waffles for another 10 minutes until they start to turn golden. Use more or less sundried tomatoes depending on how intense taste you prefer. You might also try adding 2-3 T of nutritional yeast for extra cheesy flavor. Nele Liivlaid embodies a Whole Food Pland Based Lifestyle. She uses her site, Nutriplanet.org to provide information about proper nutrition, exercise and healthy minds directly into your hands through articles, blog posts, tutorial videos, recipes and shopping/eating out guidance. I compile my health and nutrition research, knowledge and certificate in Plant Based Nutrition into ready-to-use tips for you to plug into everyday living. Follow me on Instagram , Facebook and Pinterest. Allow to proof for 10 minutes. Add salt and seasonings and mix well. Add flour and mix until a dough ball forms. Knead with stand mixer for 5 minutes or by hand for 15 minutes. Dough will be ready when it pulls away from sides or becomes soft and elastic. Cover with Saran Wrap and a towel and allow to rise in warm oven for 60 minutes. Punch down and form into a tight ball. Cover and rest for 10 minutes. Stretch dough to fit pizza pan and place in oven for 5 minutes. Preheat oven with the dough to 500 degrees. After 5 minutes, remove pizza dough and add sauce and toppings. Bake in 500 degree oven for 10 minutes. Finish on preheated pizza stone for 1 minutes if desired. Add the bananas to the food processor and process on pulse until it all gathers up together. Add your liquids and process until everything is integrated. Add the liquids first and then the banana on top of that. Blend until all is combined. To make it less orange-y/more creamy, use 1/4 cup of orange juice and 1/4 cup almond milk or vegan creamer. Sprinkle with nutmeg or cinnamon and eat that nomminess up. Add all ingredients to a pot, except tapioca starch, and bring to a boil, reduce to a simmer until tender, adding in more liquid if needed. In a separate bowl, place tapioca starch. Remove a few tablespoons of hot liquid and add to tapioca starch, stir until combined, and return to pot. Simmer until sauce-like consistency, and stir in reserved berries for a little added texture. Serve atop waffles, chia pudding, or use as a jam. Sauce gets even better the next day! Sometimes rhubarb can be stringy. If this happens as you cut it, remove the strands. Stores 5 days in fridge. Add watermelon and dates to a high-speed blender. Carefully pour the mixture into the bowl of an automatic ice cream maker, and process according to manufacturer’s instructions. Place remaining ingredients in the center and mix gently. Spoon batter into a muffin pan lined with baking cups. Turn slow cooker/crock pot on high setting for the first 2 hours, then low for the remaining time. Place apple slices in slow cooker. Sprinkle cinnamon and nutmeg over apples. I give this as part of a vegan gift package during the holidays. It is very difficult to find an apple topping/butter without added sugar. Put this in your oatmeal or to top anything with a sweet warm finish. Process briefly, or pulse just a few times, until mixture begins to stick together, and is somewhat (but not entirely) blended. Scoop small portions of the mixture out with a spoon, and roll into one-inch balls, and enjoy! When ready to pan-grill, flatten one ball at a time, and use a rolling pin to create a 5- or 6-inch circle. If griddle has room, cook up to four or six loaves carefully at a time. Heat nonstick griddle or frying pan over medium high heat. Place flattened dough onto the dry hot pan. Don’t disturb, as it begins to grill. When dough starts to puff up in the middle after a few minutes, and becomes golden on the bottom, it’s time to flip. Allow the other side to cook for a minute or two, and remove from pan when toasty on the second side. Repeat with other portions of dough. Blend in Vitamix/high powered blender if using seeded watermelon, seedless watermelon blend in regular blender for 14 seconds. Pour into your favorite glass and sip with a straw!